Again, have searchable data base. Clubs that need binoculars, scopes, and field guides. clubs that want to link via social media, share videos of meetings, speakers, special events. Examples of how clubs might get started with a sister club relationship. Ask your sister club to write a brief article about themselves and their activities to be published in your club's newsletter. Help your sister club obtain physical resources it needs, like optics or field guides. Offer to advertise or highlight your sister club's events. Members of the Cayuga Bird Club in Ithaca, NY donated binoculars to members of Club Los Jiqueros (the Solitaires) from Marcala, Honduras in October 2016. 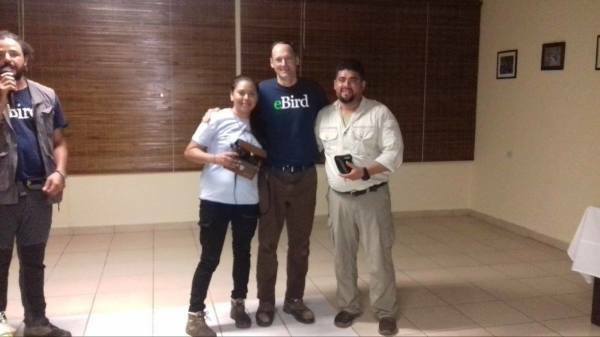 Here Jody Enck (center) from the Cayuga Bird Club is presenting two pairs of binoculars to Sarahi Morales and David Andres Hernandez Vasquez of Club Los Jigueros (Solitaires) in Honduras. Jody Enck wrote this about his experiences at the Lake Yojoa, Honduras birding blitz in October 2016 as a review of Beaks and Peaks Birding and Adventure Tours for the Blue Sky Wildlife (a marketing conglomeration of 33 tour operators worldwide). I went on six field trips over the course of three days, and saw more than 200 species of birds. The range of habitats visited was great, including open lake and associated wetlands, lowland forest, and cloud forest. I got to go birding with members of most of the bird clubs in Honduras, and found out about all of the birding opportunities and conservation efforts going on in other parts of the country. I highly recommend this experience for anyone who has never been to Honduras, but wants to get a great introduction to the birds, habitats, and people in this safe, friendly country.